The manufacturing of Reebok boxing shoes is done in Gaobu town, Dongguan city, san xian Zhongshan, and Jida industrial Zhuhai city. Reebok shoes are a simplified model which are mostly worn by Floyd Mayweather because of their lightweight, excellent support, stylish and quality build. Reebok boxing shoes are made of a synthetic sole which is easy to break in. A lot of people with wide feet prefer Reebok shoes, to other brands, and they all give out amazing comments on how they use only six hours to break in the boot. Many boxers admit that they can easily dodge punches when they are on rebook shoes, and they still be confident. Boxing shoes are one of the most crucial boxing equipment, which comes after the boxing gloves. These shoes help you to move with absolute control giving you anchored stops. Boxing shoes should feel light and comfortable. When you wear Reebok boxing shoes makes a big difference in your performance. For a beginner, it helps in improving his performance. For comfort, speed, power, and mobility reebok boxing would be an excellent choice. A shoe for boxing allows a boxer to be comfortable; they will enable you to move in a way a fighter moves. Great moves give a boxer power and speed. Reeboks boxing shoes reviews given by fighter prove how they have managed to fight confidently on the stage when they are on these shoes. The way the bottom of the shoes is built impacts the ability to balance to a boxer, ability to pivot move and to throw punches. For an excellent looking boxing shoe, the sole has to allow a fighter to stand balanced. The Reebok shoes usually don’t make a plane to feel off balance when standing on them; they don’t make you feel like the boots are forcing your feel to angle towards the outsides which are a common problem. What most boxers hate is a sole that is too thick which makes them feel too disconnected from the ground. 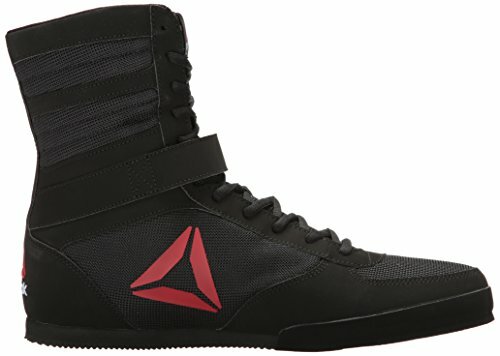 Reebok boxing shoes have a sort of a raised heel which can prevent a boxer from sitting down for maximum power on his punches. The outside texture of the bottom of Reebok shoes has a flatter surface which makes a boxer feel like he is standing directly on the ground but for the bumps makes someone feel like they are standing on a rock which is annoying. The construction of a heel and the toe wrap up and cover the heel and the toe which makes the shoe more durable. Reebok boxing shoes can grip the ground so that the feet don’t slide when you want to transfer power, but will always allow you to pivot so it may be easy to throw power punches. Most fighters prefer a shoe that is smoother and pivots easily. A perfect shoe is grippy, and helps to provide stability during power transfer, pivots easily and still keeps you connected to the ground. Too grippy shoes can make your trip. The material used helps to determine the feeling of weight and thickness. When a shoe’s sole is lighter and thicker, it makes you feel the lightness and makes you feel so much freedom in the ankle. A shoe made of a thicker sole and a lot of fabrics feels so much more substantial. Width depends mostly on a persons preference, how the materials are glued together can have so much impact on comfort. You may feel like some elements are just bothering you or feel like they are restricting your feet like it may be difficult for you to push off the ground at the angles that you want, or it may be hard to let your feet spread. But for the case of Reebok shoes, they are made of materials that make you feel comfortable, spread your legs and push off the ground to the angles you want. If your feet are narrow, then you have to take a shoe that matches your feet, and if your feeling is extensive, you need a shoe that has a similar match with your width. Reebok shoes are made to protect your ankles. It is known very well how ankle injuries are common in sports and boxing. The higher the boot, the more your ankles are supported. If you get high tops, you are likely to have lots of ankle support, for mobility you should get the low tops. These low tops can be below the ankle, above the ankle and some are even right on the ankle. Before you buy the flat tops, try different ranges first. The high tops make you feel more powerful when throwing punches. Therefore, they are not only for support. And it is durable, lasts long. This is a top brand shoe so is its quality. To know if a shoe's condition is the cute one check on the sole construction because a well-constructed shoe sole doesn’t look like it is going to peel off even when the shoe is about to wear off. Reebok boxing shoe reviews prove that these shoes are of better quality. They give a boxer balance; After dodging a punch a fighter needs to have balance, therefore, is he is on Reebok shoes he is likely to have the support, but if a boxer is not on the right shoes he is expected to lose. Many fighters have large feet, and they say they can't maintain their balance on regular boxing shoes. They are light and sturdy enabling a boxer to move quickly and change his directions fast. Reebok shoes are durable against any sharp things. Reebok shoes are liked by most boxers merely because they are protected from any ankle injuries which is a common problem in a lot of sports. Ankle support is very crucial for health matters and enables a player to stay fit during the boxing. They provide a boxer with comfort; this comfort comes from the shoe height and the type of materials this shoe is made of. Also if a boxer has bought a shoe that matches his width is likely to be more comfortable. A fighter should know if his feet are narrow or wide and get similar shoes according to his size. Therefore adequately sized shoes are more comfortable on a fighter. These shoes are easy to find online, and there is also free shipping. You will find amazing images of the boots, prices as well as sizes. You are also given a product description just below the photos so that you may be aware of what you are about to purchase before you buy it. All you have to do is make sure you select a shoe that matches your shoe size or else you are likely to suffer a loss of getting a wrong shoe. Make sure you are satisfied with the color, size and the price of course. A lot of buyers who have purchased these shoes on online give out various comments on the service as well as the quality of the shoe. Therefore, they are satisfied. 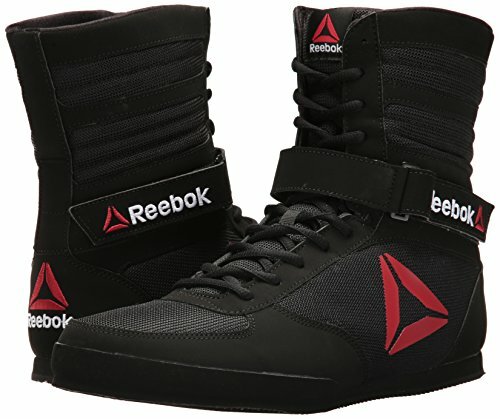 Some buyers of these boxing shoes dared to say that the Reebok is their first and only pair of boxing shoes and this means they are satisfied and that is not looking forward to getting another pair of shoes from any other brand. These shoes are the most popular brand right now. Beginners can also use them in their training since they will help them improve their performance. The design has attracted a lot of boxers as well, after seeing them from a famous trainer Floyd Mayweather as he wears them on his fights and training as well. Therefore as a buyer of Reebok shoes on Amazon, you are likely to keep this in consideration. A lot of boxers have admitted on trying various types of shoes, but so far Reebok has been their favorite. They also acknowledge on not having any problems wearing these shoes, some have also witnessed being on the winning side by having these shoes that give them comfortability and so much confidence when they are fighting. As suggested by most sports experts, as well as boxers that Reebok boxing shoes have been their favorite since they provide excellent ankle support and keep the players or boxers on the winning side. It does not cause any discomfort to anyone who is wearing them. Having cute quality boxing shoes is a significant thing, shoes are one of the most critical equipment in boxing after the boxing gloves. If you put on boxing shoes of poor quality, they make you uncomfortable, and they would probably feel like a foreign material underneath. Boxing could be the last thing a boxer would probably want to buy, but it is an investment he has to make eventually even though they are not cheap, they cost almost the same as decent shoes.